Beneath the full, blood-red moon cresting over the roof of the ramshackle farmhouse, a patch of mist drifted along the ground. Had anyone been paying attention, they might have noticed it moved with purpose towards the barn, but the two guards standing watch outside the house were more interested in what was going in inside, and mist was hardly an unusual phenomenon. The mist seeped into the barn while the guards stood on the porch and listened, fangs gleaming in the moonlight as they grinned at the sound of screams. They had chosen their hiding place well. The little farm was tucked away in a remote part of Lippe and surrounded by woodlands. The chances of someone accidentally stumbling across the location were slim, but if they did, the chances of them being seen again alive were even slimmer. The mist emerged from the barn, hanging low as it moved toward the house. Absorbed in his enjoyment of the sounds of suffering, the guard on the right never sensed the form materializing behind him, and he met the true death without ever feeling the knife that separated his head from his shoulders in utter silence. The second guard heard the thud of his companion’s head landing on the splintered boards, but in the split second it took him to identify the sound, his own fate was sealed. The dark killer dissolved into mist once more, then slipped through a small crack where the weathered wood of the door left a gap in its frame. The inside of the farmhouse was in no better condition than the outside, the only light coming from a fire burning low in a soot-blackened hearth. Yet the tang of wood-smoke was overpowered by two more powerful scents: blood and fear. A young man and a young woman were being bounced like playthings around a circle of eight nosferatu. One of the Blood Cursed held its victim in a vice-like grip, its head swooping down as it sank sharp fangs into its victim’s throat or shoulder, sometimes tearing away chunks of flesh. Then it thrust its victim at another tormenter, who fed as the onlookers laughed and jeered, drunk on the fear of their victims. Lost in their sadistic blood sport, the nosferatu never noticed the arrival of something far more lethal than they. The firelight caught the coalescing mist as it grew denser, darkening and elongating into a human form. The figure moved before it was completely solid, wickedly curved knives of gleaming steel in its hands. The head of the first nosferatu landed in the middle of the circle. Caught by surprise, the Blood Cursed gaped at the sight, seeing it without understanding what had happened. But the figure never hesitated as it continued the slaughter, intent on its lethal purpose. Before the body of the first nosferatu crumpled to the ground, a second head flew. One of the vampires finally recovered from its shocked paralysis and turned in the direction of the attacker. But for all the vampire’s preternatural speed, the attacker was faster, a blur of dark motion no human eye could have hoped to capture, and the vampire’s shout became a gurgle as razor-sharp metal slid across its neck, opening a gaping wound from ear to ear. The next vampire in the circle suffered the same fate, then another head bounced to the floor. In the space of a few seconds, the nosferatu were dead, and only the two whimpering, trembling humans remained. The tall, black-clad figure pulled out a cloth and cleaned his knives with meticulous care before sheathing one of them, and then he used the other to cut strips of cloth from the nearest vampire’s clothes. He bound the humans’ wounds as best he could with a surprisingly gentle touch for one who dealt death so easily. “Can you walk?” he asked in oddly accented German. The young man slid his arm around his companion, supporting her, and nodded. “Thank you.” The young woman’s voice was weak, but she rallied her strength admirably. Both young people nodded, their eyes glazed. “An animal attack,” the young man murmured. “Good. Now go and keep to the path.” The man steered them toward the door, pausing to watch as they made their way out of the house. He kept a close eye on them until they were out of sight, and then he went back inside. He sheathed his other knife and began rifling through the vampires’ clothes, checking their wallets and taking the cash. He stuffed the bills into his pockets, then searched for weapons and ammunition that might be useful. He ended up needing a bag to carry his pilfered treasures; fortunately, he found a backpack tossed in the corner. There was blood on it, but dried, not fresh. Likely it had belonged to a previous victim. He hefted the heavy pack on his shoulder and left the house. Once outside, he considered torching the place. There might be others who knew of it, and burning it would give them one less place to hide. He went back to the barn to retrieve one of the cans of gasoline he’d seen stored in there, and it wasn’t long before he was watching the vampires’ nest burn. Well done, my son. I will see to it that the blaze does not spread. Gaia’s voice flowed through him, filling him with warmth, although his somber expression didn’t change. With their sire gone, Tepes’ children were dwindling in number already; he was happy to hurry their extinction along. Tepes’ line has lingered this long. It will linger a while longer out of necessity, Gaia continued. We have a much greater problem facing us. Thrace has emerged from hiding, and your kin need your help to vanquish him once and for all. It is time for you to return home at last. 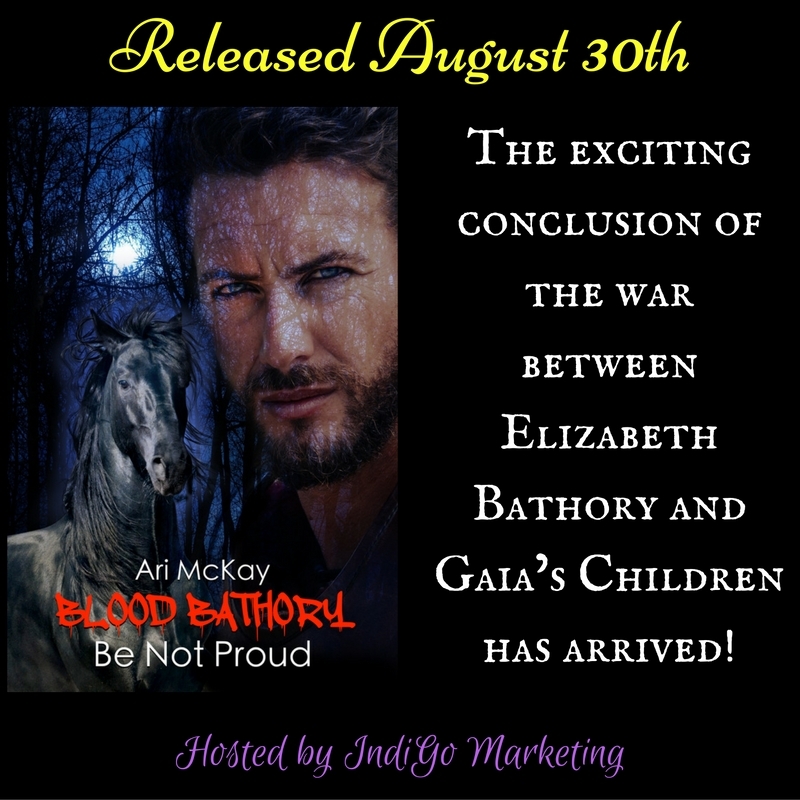 Ari McKay is the professional pseudonym for Arionrhod and McKay, who collaborate on original m/m fiction. They began writing together in 2004 and finished their first original full length novel in 2011. Recently, they’ve begun collaborating on designing and creating costumes to wear and compete in at Sci Fi conventions, and they share a love of yarn and cake.